The plan was simple, head up Catbells then up onto Maiden Moor to High Spy, returning via Dale Head, Hindscarth and Scope End. 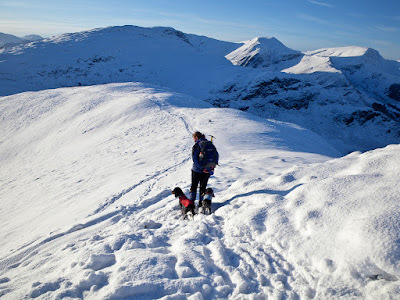 Now I knew there would be snow but the forecast was that the tops would be wind scoured making progress easier and thought that maybe we would need to cut the walk short by diverting down into Newlands before Dale Head. In the end we got as far as Bull Crag on Maiden Moor, the snow was shin deep but occasionally and unexpectedly knee to waist deep in places. It was just too much for our dogs, they were finding it hard going so we decided to call it a day and return to Rowling End Farm via Little Town. Click on the image above to see more pictures from the walk. This web site is best viewed with Google Chrome especially if you find the pages slow to load with Internet Explorer.